Dr. Catana Starks is a history maker in the field of American sports having distinguished herself as the first African-American woman to coach an all men’s team at the collegiate level. A native of Mobile, Alabama from the Trinity Gardens area, Starks was previously a former swim coach at Tennessee State University, which is also her alma mater. 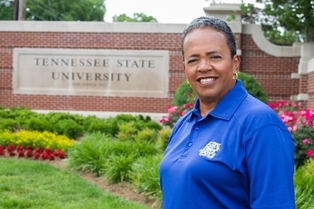 During her tenure at Tennessee State University, Starks became chair for Human Performance and Sports Science where she continues today. Her unprecedented career as golf coach at the university included forming its first ever golf team and coaching many young men who went on to successful careers in and out of the field of sports. Among Starks’ former students include: Rob Reed, now head football coach at Tennessee State University; Sam Puryear, Director of Golf Operations at Queens University in Charlotte after having served as Michigan State University’s head men’s golf coach- the first African-American in its history; Robert Dinwiddie, an All-American golfer at TSU and a current member of the European Tour having achieved three consecutive Top-10 finishes in South Africa; and Sean Foley, the swing coach for golf icon Tiger Woods. Starks’ years of hard work and unwavering dedication were further realized when she led the Tennessee State University Tigers to the National Minority Golf Championship, with the all-time best score record for the tournament. Catana Starks also earned her Doctorate Degree in Educational Administration from Tennessee State University. She advocates for the reduction of inmates prison sentences for those whose drug-related incarceration occurred early in their lives.